I think I’ve found the perfect button-up for spring! 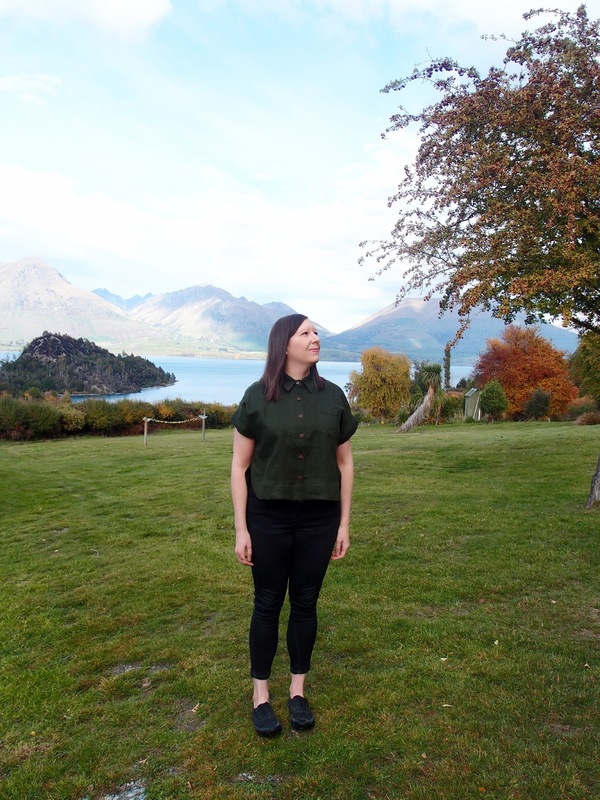 As soon as Heather Lou from Closet Case Patterns released the Kalle Shirt pattern I knew I had to give it a go – the cropped, loose, boxy fit was pretty much everything I had been looking for in a button-up. But my love for the Kalle started off slightly rocky. Knowing that this pattern might be a bit challenging I decided to sew a first draft using some cheap drapey twill, and it ended up being one of those sewing projects I wanted to throw into a corner and forget about. It was my first time sewing a yoke using the burrito method, and it took me three (yes, three!) goes to get it right. I also struggled when attaching the deep hem facing, and ended up having to unpick the collar after a failed first attempt and cut and sew a new one. Things just weren’t going well. But after leaving it balled up in said corner for a few days I came back to it with a renewed sense of calm and persevered. And I’m really glad I did, because it ended up looking pretty decent, and despite making it in some less-than-amazing fabric, it’s something I’ve been wearing often. This second attempt went much more smoothly. In case I didn't realise this already, it really hammered home how taking things slow, persevering and practicing different sewing techniques can pay off, and while I know this is not a perfect garment (that collar is a bit wonky, for one) it’s so heartening to see my skills improving. Oh, and I’m now a total convert to attaching yokes using the burrito method! 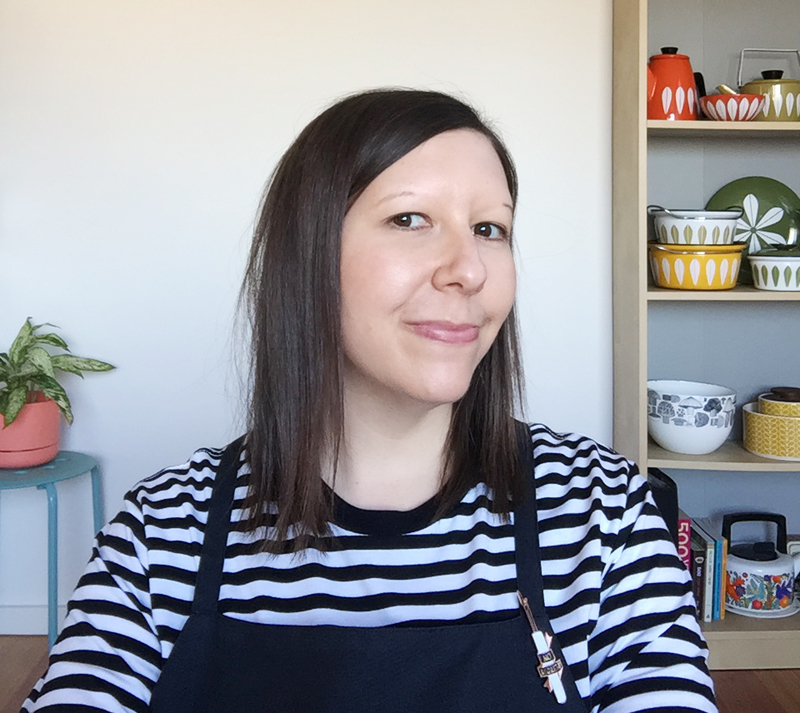 Credit also to Heather’s easy-to-follow instruction booklet and the Kalle sewalong – these resources really do help, and I’m much more inclined to purchase a more difficult pattern from an independent designer when I know there’s a sewalong I can follow. So, a little about this versatile pattern. 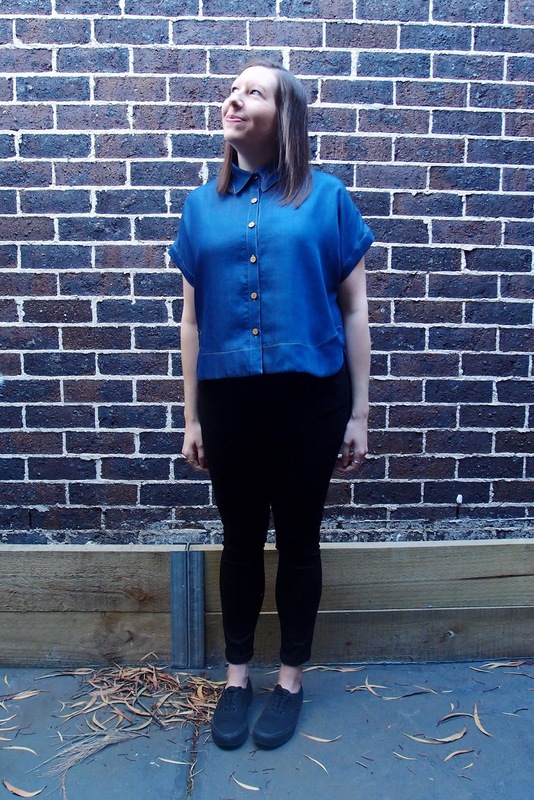 The Kalle comes with three different length options – a cropped button-up, a tunic and a shirtdress. There are some other variations too, like a regular collar and a band collar; a pocket; options for an inverted or box pleat; and a button, pop-over or hidden placket. 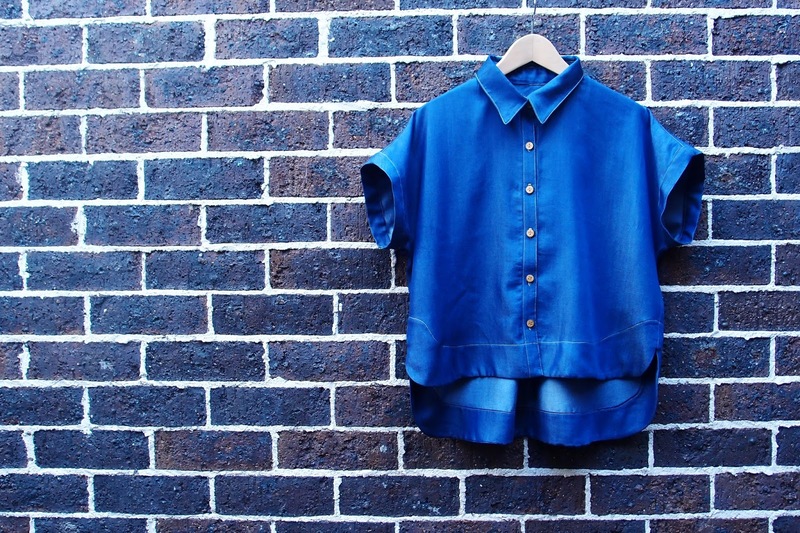 All versions feature a subtly curved yoke, kimono sleeves with arm cuffs and a shaped hem. 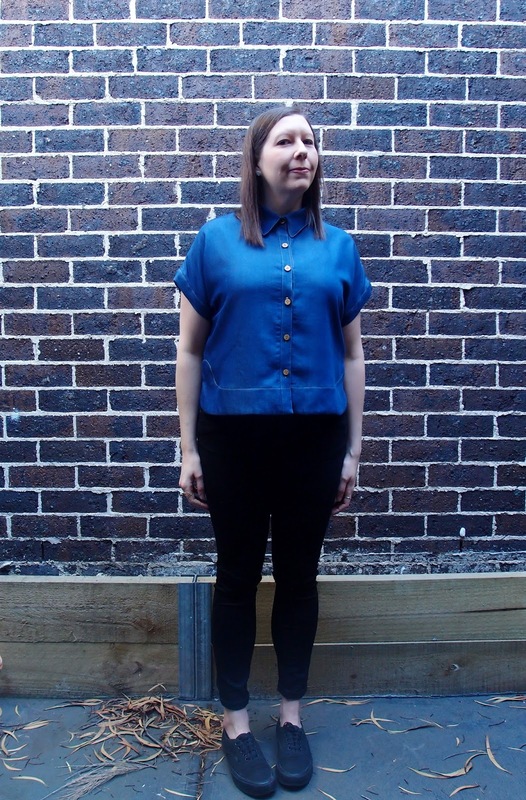 This is the cropped version with a regular collar, button placket and box pleat. 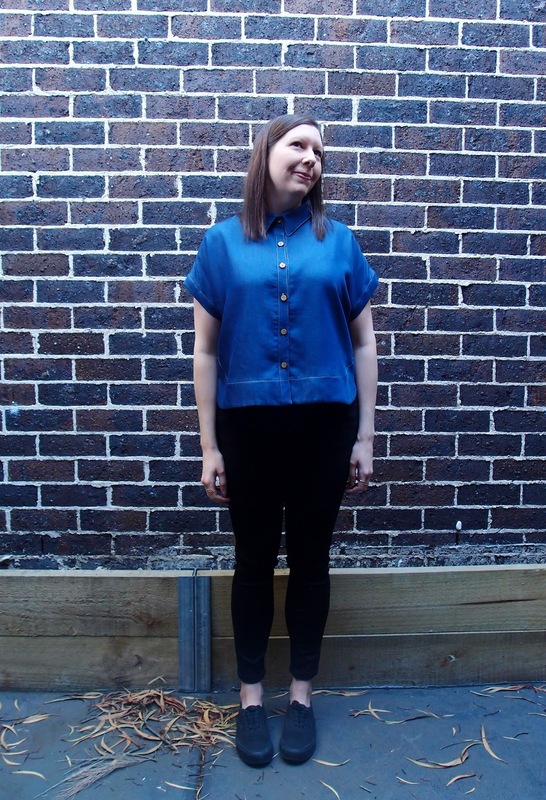 I made up a size 14 (which is nicely roomy), and I decided to lengthen the front and back pieces by 5cm (and add another button), which I think was the right call for me – it’s comfortably cropped without fear of accidental midriff flashing. 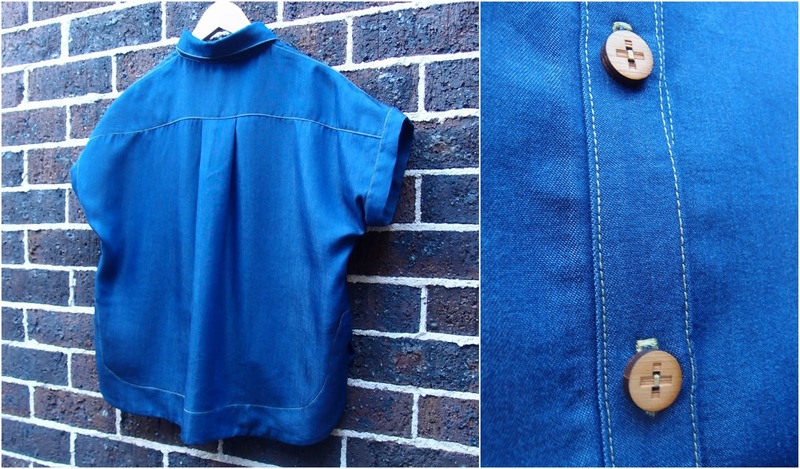 I used some dark blue denim Tencel from Spotlight, and the beautiful wooden buttons are from Arrow Mountain. I topstitched using contrasting gold-coloured thread, but I'm not entirely sold on it for some reason. I’m planning on making the shirtdress version of this pattern in the same fabric, so next time I think I’ll stick to blue thread. 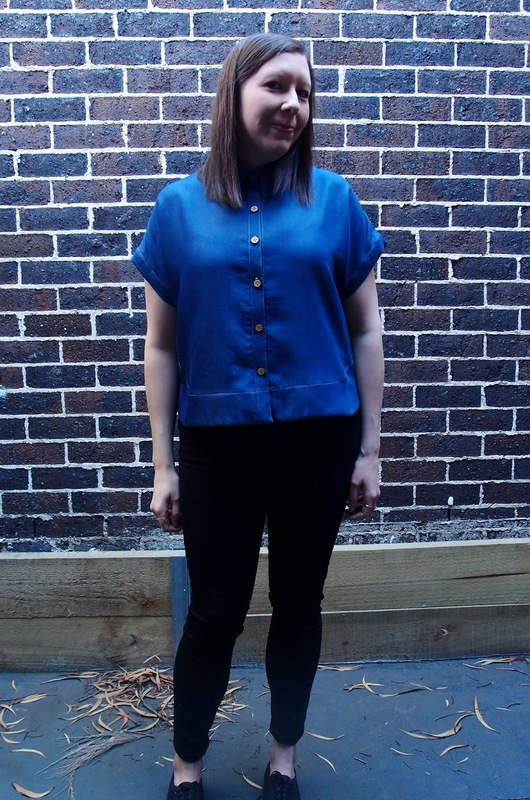 Heather has incorporated some lovely details that I think help to elevate the Kalle from a regular button-up. The box pleat, the angled sleeve cuffs and the high-low hem all add up to a well-tailored shirt that is still casual and relaxed. And there are so many options for variations, and different results depending on the fabric you choose. I think this might just become a new tried-and-true pattern for me, and I can’t wait to try out some other options! Thanks Sarah! It's a great pattern, you should make that purchase!